Over the past 10 years, The Pink Giraffe has become your one stop shop for monogrammed gifts. We specialize in personalized wedding gifts and we love to help with bridesmaids and graduation needs. We specialize in fine bedding like our Matouk monogrammed bed linens and shower curtains for the upscale home. Redecorating? We can help. A monogrammed coverlet or duvet cover on the bed can finish a room with personalized style or one of our luxurious pillow shams. We take pride in the high-quality custom finished product we deliver. You will love your new bed so much you won't ever want to leave. At The Pink Giraffe, we especially love to help our customers choose that perfect preppy outfit embroidered with initials. 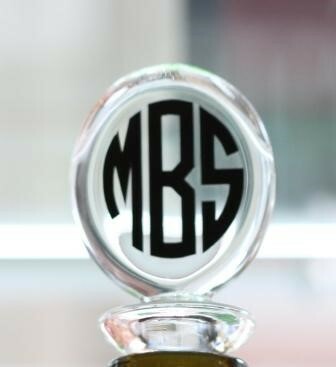 We strive to offer an extensive selection of unique monogrammed shoes and clogs that are customized and can accent any outfit. Add any of our beautifully monogrammed jewelry or something from our section dedicated to clothing for women for something personalized and preppy that will help you stand out from the crowd. When you order from The Pink Giraffe, you can rest assured that your monogramming is in good hands. The one and only amazing Velma is our head embroiderer and has been at it for over 22 years. When you order from us, you get expertise. She will make sure it is right. She is meticulous and we are so grateful to have her filling your embroidery orders for our online boutique as well as our brick and mortar shop in Goodlettsville, TN. With meticulous attention to detail, she fills each and every order that comes through our website. If you have any questions about the products listed on our site, give us a call. We love to hear from our customers! One question we get all the time - "Do you embroider items not purchased in your store?" And the answer is absolutely yes! With an extensive range of monogram and embroidery fonts to choose from on our wide range of gift items listed on our website, the possibilities are endless for your custom embroidered design. Need some contract embroidery done for your corporate event or company? The Pink Giraffe specializes in stitching large quantities of ball caps, hats or golf shirts for your company event. Once upon a time, a little girl was born who was preppy from birth (We all know that girl, right?) Well, this little girl's mother opted not to give her a middle name because she thought it was the "new thing". Little did she know, that preppy little girl would love monogramming so much that she would yearn for the day when she would one day meet prince charming and finally walk down the aisle to accept that middle initial and a brand new monogram with the same fervor that an Olympic athlete accepts a gold medal. 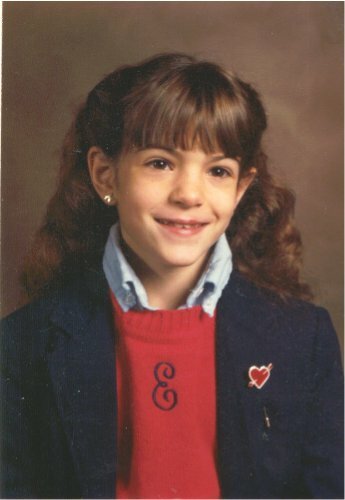 That poor little girl had monogrammed everything with a lonely sad single initial.......hence the 4th-grade photo. That girl's obsession with monogramming turned into repeated post nuptial trips to the local monogram shop and embroidery store (which she later purchased) and turned into an online business in 2006. A new location and 12 employees later, along with a red-haired little sister joining the ranks of the customer service department. Now, we are processing orders daily and strive to get each and every order out to you as quickly as our little hands can ship it out! Need a monogrammed baby gift in Nashville with a quick turnaround? Since we do all our embroidery in-house we are able to offer quick service for those last minute parties, baby showers or wedding celebrations. 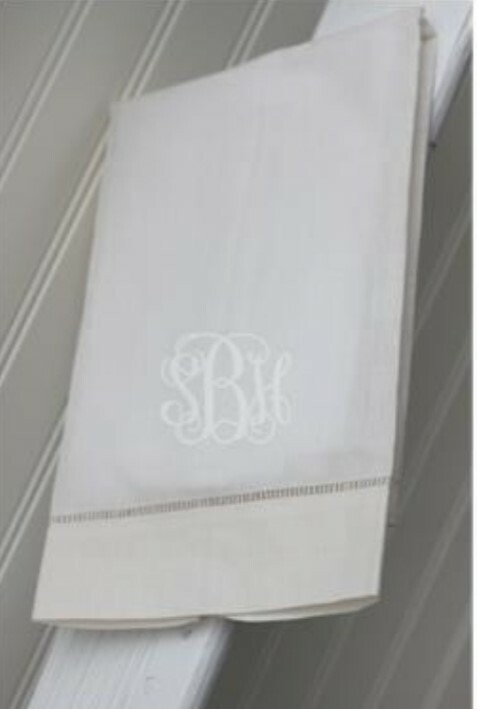 We offer a complete line of fabulously unique logos and monograms for your shower curtains, napkins, towels and phone cases as well as linens that you won't find everywhere else. We are sure to have something that you will love. Email us at [email protected] or give us a ring at (615)297-2604. We are always happy to help! Need a great personalized gift in the Nashville area? As a premier online gift store, our boutique shop is able to offer custom embroidered items for babies, graduations, birthdays, bridesmaids and any other person on your list this year. They will simply adore their unique monogrammed holiday gifts from The Pink Giraffe this year!